Hollywood's last odyssey into the biblical text was a huge success if I recall––remembering Mel Gibson's "Passion of the Christ". Yes, the box-office coffers were overflowing so-to-speak. 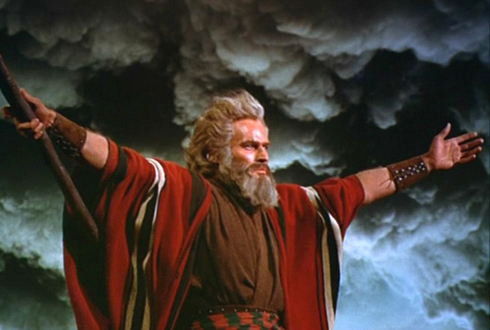 And who can forget the iconic "The Ten Commandments" starring our own staff wielding turned gun slinging NRA poster child Charleston Heston may he R.I.P.. The recent media blitz on the newly elected Pope Francis, the 266th pontiff of the Roman Catholic Church has Hollywood primed to lock down additional epic Bible films with Moses as the motif. Producers are undoubtably yelling once again, "pass the plate" (hey, timing is everything in this business). Allow me to set my cynicism aside for a moment , the prospect of Hollywood delving back into the sacred text could actually be a good thing. With the latest filmmaking technical advancements and visionaries like Ridley Scott and Ang Lee at the helm "The Good News" could be delivered as a stunning spectacle for a modern audience. Let's just hope that a rush to turn a profit doesn't short-change "The Good Book" and bring a HOLY SH!T STORM from Heaven! "NOAH" FILM SCORNS THE RIGHTEOUS! Remember that Holy $hit Storm from Heaven I mentioned in the above post? I believe I can feel the wind kicking up and I spy some dark clouds rolling in now . "Black Swan" director Darren Aronofsky's new film "Noah" based on the biblical text is experiencing rough seas. The film's producer Paramount Pictures and Aronofsky can't agree on the third act (the scene after the great flood). Aronofsky introduced some footage to a largely Christian audience at a Texas convention in July. Talk about cohonas! Isn't Texas NRA territory smack dab in the heart of the Bible Belt ? Double whammy! Then again, if you're going to take creative license with one of the most famous stories in the Bible (which happens to be the most famous book in the world) I guess one should seek the counsel of some of its most fervent followers. While the film was well received there, others feared that Aronofsky was veering off track by making Noah "the first environmentalist." 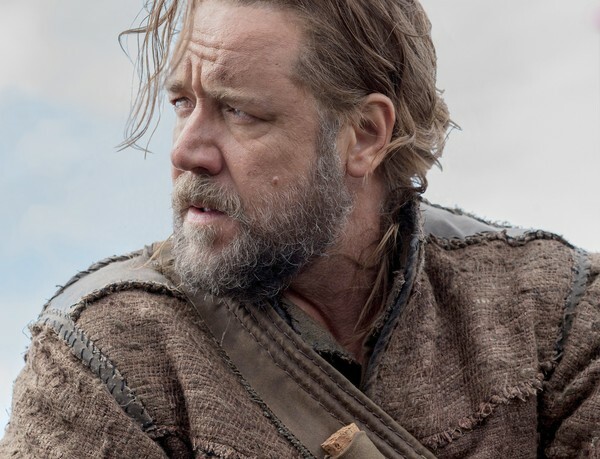 Brian Godawa, a Christian-minded screenwriter, got a copy of an early Noah script last year, he concluded it was "an uninteresting and un-biblical waste of $150 million that will ruin for decades the possibility of making a really great and entertaining movie… This movie will be rejected by millions of devoted Bible readers worldwide, because once again it subverts their own sacred narrative with a political agenda of pagan Earth religion that is offensive to their faith." Wheh! Sounds like Godawa is calling for an all-out holy war against the infidel by inciting the pious to rebuke the wayward reenactment. Visions of massive religious boycotts of the film being covered by the media come to mind with scores of the righteous chanting, "HELL NO, WE WON'T GO!" Avoiding a sanctimonious scolding could and should be priority number 1 at Paramount at this juncture. They are after all co-producers of Noah with New Regency. After the film was recently screened before Christian and Jewish audiences, Paramount vice-chairman Rob Moore stated that the movie was simply going through a, "normal preview process," and that the studio "allowed for a very long post-production period, which allowed for a lot of test screenings." No doubt the less than glorious reviews by the screening of attendants prompted the studio to encourage Aronofsky to change the questionable third act. Aronofsky remaining true to form flatly refused. This isn't Aronofsky's first time at the rodeo and going round-for-round with studio execs. He went through a similar to-and-fro with Warner Bros. executives concerning budgetary and script issues over "The Fountain." Aronofsky's critically acclaimed film "Black Swan" was held up over disagreements between the director and studio Fox Searchlight over whether Aronofsky would retain final cut. During the Black Swan production the director was described as "not made for studio films" and The Reporter quotes a talent rep close to the Noah film as saying, "he's very dismissive. He doesn't care about Paramount's opinion." This is ironic, because Noah represents the director's first real attempt at a blockbuster. He has demonstrated a long time ambition for big budget films by his flirtations with directing Batman, Watchmen, Robocop and The Wolverine. The dilemma between Paramount and Aronofsky is nothing new to Hollywood. Studios tend to care about the bottom line and ROI and directors care about the vision. Meeting in the middle can sometimes require a small miracle. Whatever the outcome, let's just hope that the final cut of the film doesn't make a mockery of the good book. Amen? AMEN! Noah stars Russell Crowe as the biblical hero and features Jennifer Connelly, Anthony Hopkins, Emma Watson, Logan Lerman, and Ray Winstone. The film is set to s storm theaters March 28, 2014.